Looking for a perfect activity to do with your family, friends, or significant other? Our Private Mini Tour at Sunshine River Tours provides an exciting adventure people of all ages can enjoy. You’ll enjoy a fun boat ride through the Crystal River and venture to the springs, which are teaming with hundreds of manatees. 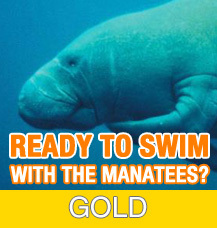 Here you’ll swim and snorkel with Florida’s manatees and meet them face to face. Before your journey, your captain will teach you everything you need to know about interacting with these gentle creatures. In addition to learning manatee facts and their behavioral patterns, our captains are extremely knowledgeable about the Crystal River and Florida’s manatees, so they’ll be able to answer any questions you may have. Between April 1 - November 15 an In-Water guide will only be on the tour with you if you pre-purchase the Ultimate In-Water Experience, we do this to keep our tours as private as possible. Our tours are conducted daily, year round. You’ll travel in a beautiful houseboat, which is heated during the winter, and complementary beverages provided. Available by Phone booking as well.